Because the meetings of the TecRMI User Group in Holland for the Benelux and Germany for the DACH region met with such great interest, TecAlliance held two User Group Meetings for TecRMI users from France and Italy for the first time in November. 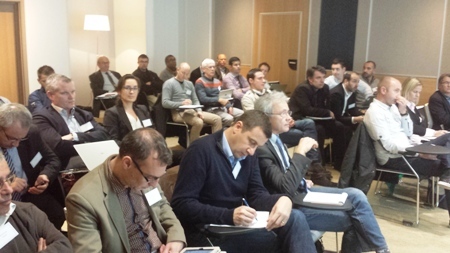 Forty participants came to Paris on 4 November 2014 and to Milan on 11 November 2014. The goal of the events was to bring TecRMI data users together, in order to inform them of the latest developments at TecRMI and discuss market requirements with them. Feedback from the participants will be considered in the further development of the market solution. The participating experts from the repair and maintenance sectors valued the possibility of exchanging ideas with their colleagues from the business. In both events, Ralf Pelkmann (Vice President Information Management – TecRMI) presented general information on the strategic importance of TecRMI as a brand of TecAlliance, gave an overview of the different TecRMI solutions and their contents and presented the latest news and development focuses. In two discussion rounds, participants had the opportunity to express their wishes and expectations to the TecRMI User Group and TecRMI. “The TecRMI User Group is an additional communication platform ‘from the business for the business’ under the umbrella of TecAlliance. We stage this event in different countries – so far in Germany, the Netherlands, Italy and France. For us, it is a marvellous opportunity to learn even more about the wishes and requirements of the TecRMI data users in the different markets. The TecRMI User Groups play an important role in the continuous optimisation of the market solution. Participants here have the unique opportunity to hear about, how other RMI experts use the TecAlliance data and can exchange their own ideas about how to use it,“ says Pelkmann in summarising his impressions after the sessions. The meetings of the TecRMI User Group are held regularly in different European countries. The current schedule can be found on the TecRMI website. If you would like to join the community, please contact Christian Metzger, Solution Management TecRMI, by e-mail atchristian.metzger@tecalliance.net.